Boldly going where few have ventured. Located on the northeast shores of British Columbia's Kootenay Lake sits the small village of Kaslo, B.C., which is home to Jason Remple and the base of operations for Stellar Heli Skiing. Growing up in the Kaslo area, Jason knows this country like the back of his hand and his knowledge of the area has made him one of British Columbia's premier ski guides. Jason has been guiding both skiers and snowboarders through the Kootenay, Selkirk and Purcell Mountain ranges for over 20 years. His knowledge of this area and easygoing personality provide his clients a positive heli-skiing experience even if you're a first-time heli skier like Dan Nelson from Spokane. "First time heli skiing and first time in a helicopter. It was nuts. I had butterflies in my stomach. Jason knew exactly where to go, and he knew every aspect of the runs we were on. He's a pro, definitely," Dan says. 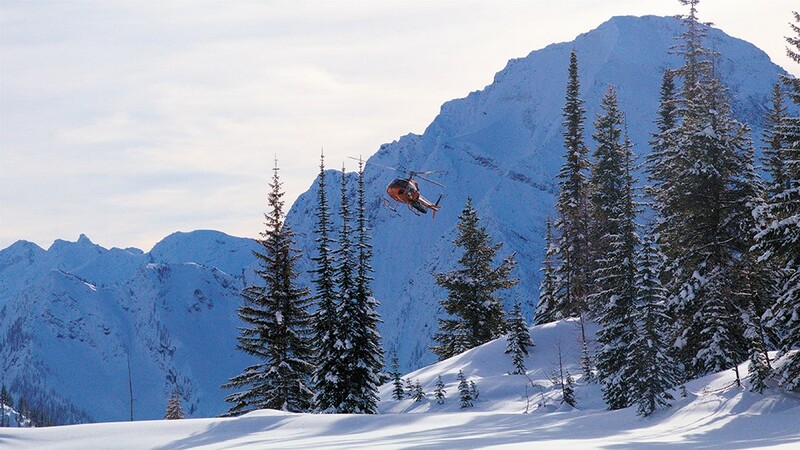 Nelson has been skiing for over 30 years and the idea of heli skiing has always been a dream. After all, who wouldn't want to be dropped off on a mountaintop over untouched powder? "This is definitely a good way to get something off your bucket list and it's close, two-and-a-half, three-hour drive from Spokane and I was here," Dan says. That's pretty close to get to some awesome skiing that's helicopter-accessed. Stellar Heli Skiing offers guests a more intimate experience. "We only use the A-Star helicopter, so small group heli skiing, and that's really significant because you're working with small groups," Jason says. "You're able to get into more unique terrain and travel at a pace that's whatever the group needs so you're not waiting around for the rest of a large group." Our small group consisted of John Witt, a former world champion mogul skier from Saratoga, New York, along with local backcountry skier Marie Ange Fournier, myself and Dan. Jason talks about the type of terrain they access and says, "We've got everything and we can customize the day to the clients' needs, so anything from alpine, big chutes and bowls, to steep-tree skiing." Steep-tree skiing is what our group was treated to the first few days. Dan was blown away with the lanes through the trees. "The stuff we've skied was just killer hallways through the forest," Dan says. "Deep, steep and perfectly spaced out trees, just good stuff. Really, really fun." Glading is all done by Mother Nature, according to Jason. "We have fantastic tree skiing," he says. "There's a lot of places within our tenure that have this natural spacing, so there's no glading or anything that's been done to it. It's just beautiful wide open trees, and steep stuff, too. You can just keep your speed up and rally right through that stuff." That's exactly what we did and after an epic day of charging hard through the powder-filled forest, we headed back to where Stellar Heli Skiing puts up its guests, the renovated Kaslo Hotel, which is a modern rendition of an historic, Victorian-style hotel located in the downtown of the Kaslo village. Our condo-style three-bedroom unit overlooked Kootenay Lake and had all the amenities like high-speed internet so we could gloat and rub it in by sending powder-ski pictures to our buds back home. I know they would do it to me! The main level of the hotel has a restaurant and pub which was very convenient as we arrived late in Kaslo on our first night and didn't want to venture out. Stellar Heli Skiing offers packages from single-day skiing to week-long packages for clients coming from long distances. "I think that boutique heli skiing, like Stellar, is the way to go," Jason says. "You get the personal experience with the guide. You get the small helicopter. You get the unique terrain." After one of our ski days we ventured down Main Street in the early evening and made a stop at Kaslo's local brew pub, the Angry Hen, to sample some of their locally made craft beers. As we sat there testing several of their beers on draft, we had good conversation with some locals who suggested we hit the Taqueria El Corazon around the corner for dinner. "Wow" is an understatement as we dined on authentic Mexican street food with fresh, local, organic ingredients. I highly recommend the fish and shrimp tacos in corn tortillas made from scratch on site. They also have a huge selection of unique tequilas, and the owner really knows tequila. Bueno! After two days of rallying the steeps through the trees, the sun made a grand appearance on our final day. Jason took us across the Kootenay Lake to some high, wide open, alpine skiing in the picturesque Purcell Mountain Range. As we flew in the A-Star up the main drainage, Dan says, "It was really impressive flying up the valley, seeing stuff that was just like, 'Wow.' I found myself saying to myself, 'I could ski that and that and that.' I was like a kid in the candy store. It was definitely an over-the-top experience." Throughout our final morning, the five of us, including Jason, skied some leg-crushing vertical, sometimes skiing over 2,000 vertical feet. Talk about some leg burn. But with bluebird skies and soft snow we managed with a big ol' grin. Dan Nelson learned a valuable lesson on this trip as he stood, a little long, over the top of the untouched line he was going to ski. Johnny Witt slipped by Dan and snaked his line as the rest of us were laughing at Dan. We could hear Witt laughing uncontrollably the whole way down the run. When Dan skied to the bottom moments later, Witt reminds him with his sarcastic laugh, "It's not your line until your looking back up at it." Lesson learned. Dan sums up skiing the high alpine in the Purcells, saying "Skiing in this big open terrain is an awesome experience. The snow was super deep and you're shredding hard with your buddies. I'm always excited to go skiing, but this was a whole new level for me."